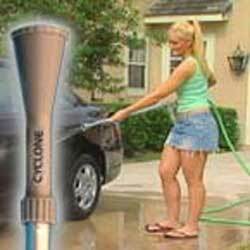 Wash and wax your car in one easy step with the Cyclone. The Cyclone’s special Wash & Wax formula never needs drying! No rubbing! No buffing! You receive the Cyclone, the FREE multi-spray attachment and the Cyclone Power Car Vac.NO RUBBING, BUFFING or DRYING EVER! EZ extend handle eliminates bending, reaching and straining. The Cyclone is great for everything from washing & waxing your car, to power washing decks, sidewalks, house siding, windows, even spraying your flower bed. NO RUBBING, BUFFING or DRYING EVER! EZ extend handle eliminates bending, reaching and straining. The Cyclone is great for everything from washing & waxing your car, to power washing decks, sidewalks, house siding, windows, even spraying your flower bed.